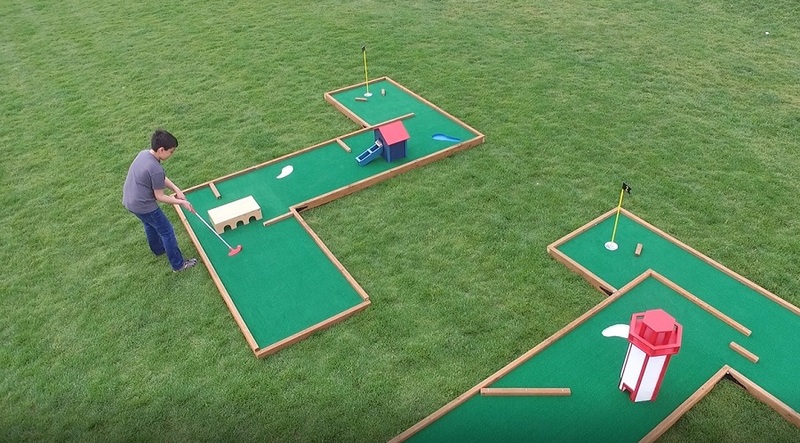 Quality-crafted mini golf sets, using high-quality materials for durability and years use. 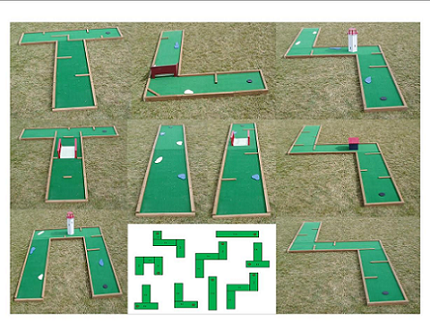 Each mini golf course is designed to be very portable and durable. 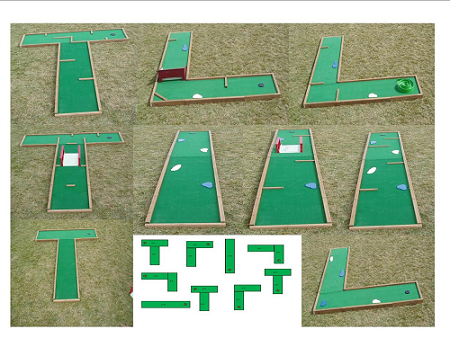 Our mini golf courses for sale can be set up in 20 minutes or less and can be used almost anywhere indoors or outdoors. We have incorporated sand, and water traps into all holes so they can be used as mini golf courses or putting greens. 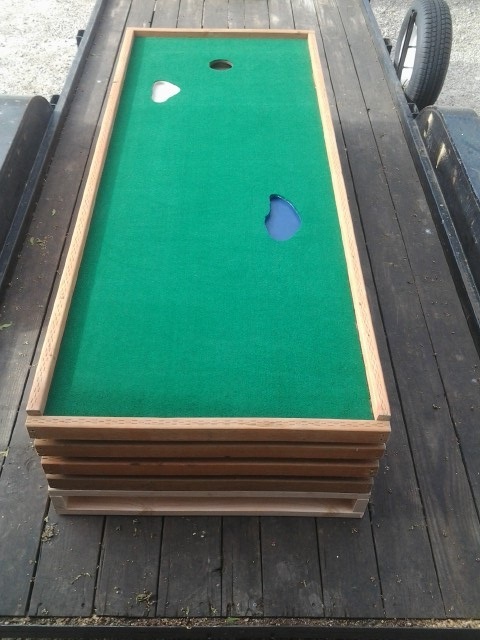 Portable Mini Golf Courses from Amusement Wholesale are shipped complete and ready for your use. 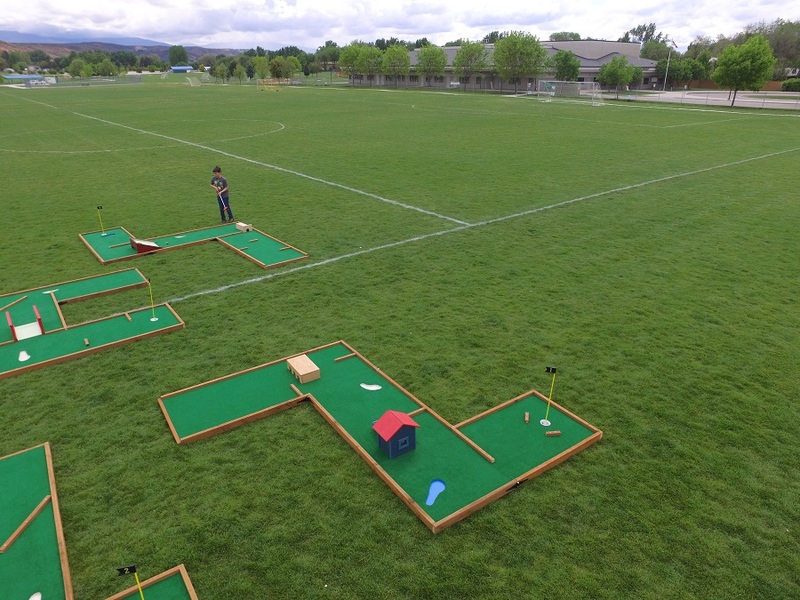 The portability of our mini golf courses give you the flexibility you need! 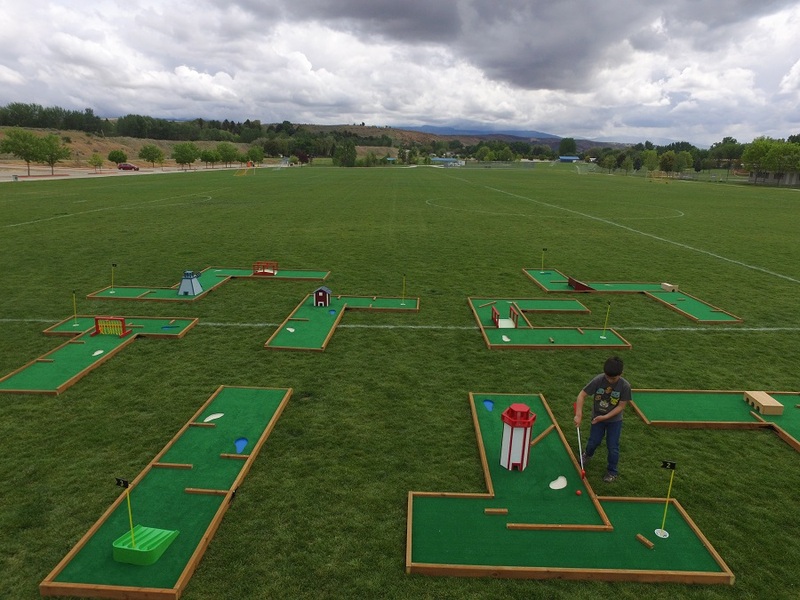 Our mini golf courses have been used in business for over 15 years with great success, and minimal wear. 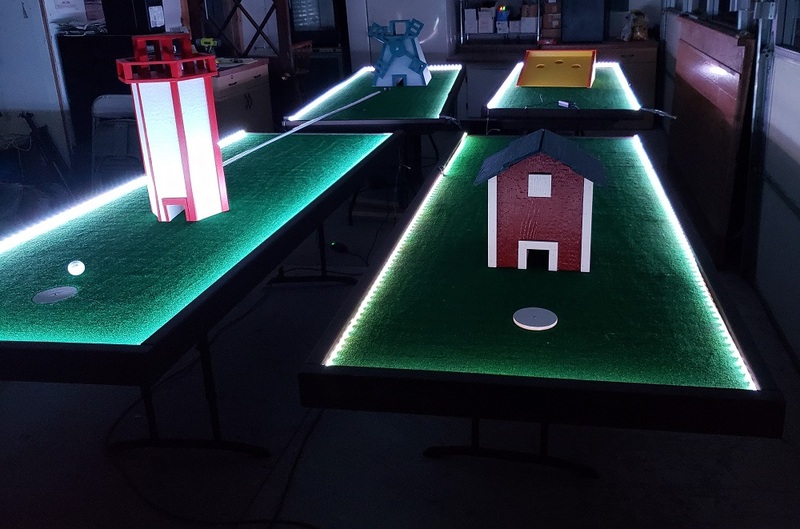 Our mini golf courses for sale are a great feature to add to any Party Rental Company looking to expand their rental line. Great rental opportunities for trade shows, birthdays, corporate functions, promotional events, fund raising, guest entertainment, and more! Available in 24 and 36 inch wide greens. Obstacles can be ordered separately. Shipping Time: Allow 2-4 weeks for delivery. Each green weighs 60 - 85lbs constructed of marine grade plywood & pressure treated wood sides. Dimensions of greens are 8ft long and 24 or 36 inch wide playing surface. Description of all included accessories can be viewed on golf accessories page. Obstacles included Barn, Windmill, Light tower, Silo, Gopher Hole, Tripple Oak Tunnel, Chain Obstacle, Wood Bridge, Hole Drive. Obstacles included Oak Tunnel, 360 Loop, Ball Speedway, Mole Hole, Pinway Bridge, Plinko Bridge, School House, Swinging Block, Watermill. 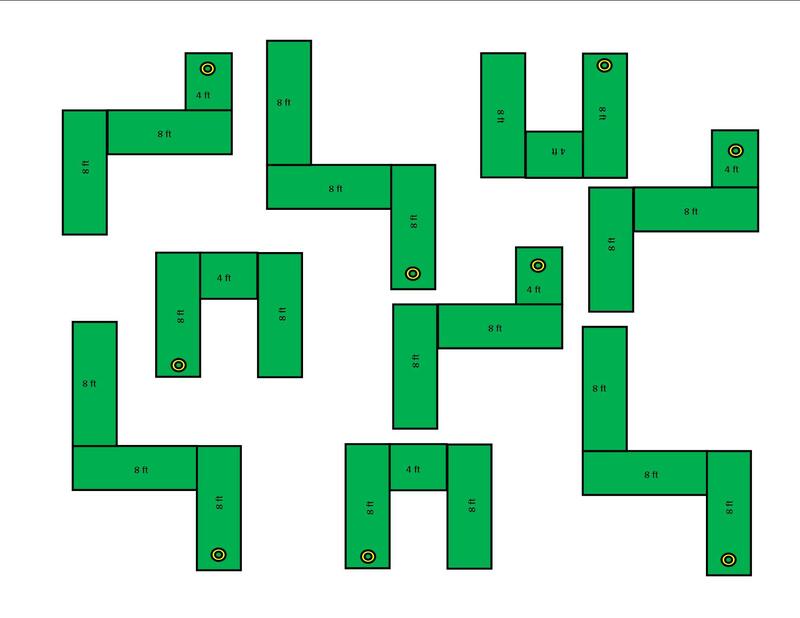 Dimensions of greens varies but all are 24 or 36 inch wide. Obstacles included Barn, Windmill, Light tower, Silo, Gopher Hole, Tripple Oak Tunnel, Chain Obstacle, Wood Bridge, Hole Drive, Single Oak Tunnel, Swinging block, Wood Bridge. 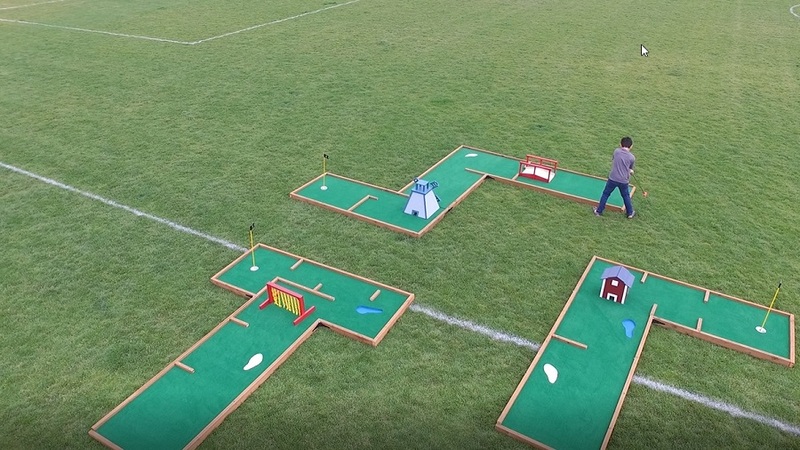 Obstacles included Oak Tunnel, 360 Loop, Ball Speedway, Mole Hole, Pinway Bridge, Plinko Bridge, School House, Swinging Block, Watermill, Chain Obstacle, Triple Oak Tunnel, Wood Bridge, Silo, Windmill, Triple Oak Tunnel. 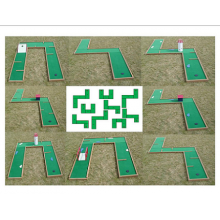 MGP001-24/36 Mini Golf Package #1 Beginner Course great for younger players. 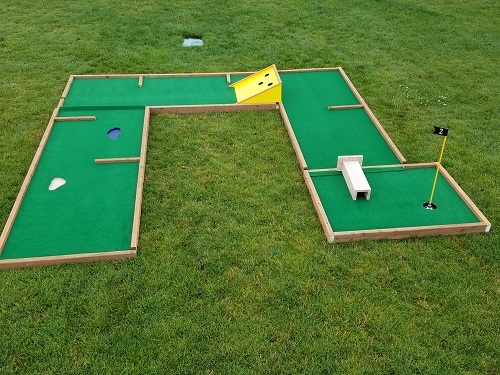 Par 3 course Mini Golf Package Includes Available in 24 and 36 inch wide greens ( Please add +$1000 if ordering 36 inch wide greens - Selec..
MGSP001-24/36 Mini Golf Starter Package Beginner Course great for younger players. 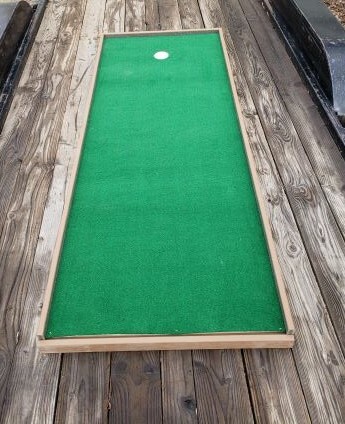 Par 3 course Mini Golf Package Includes Available in 24 and 36 inch wide greens. Set of six or nine flags with bases 18 putters in 9 youth & 9 adu..
MGP002-24/36 Mini Golf Package #2 Advanced Course great for experienced players. 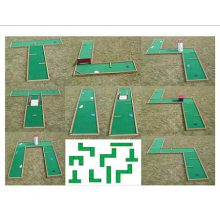 Technical Par 5 course Mini Golf Package Includes Available in 24 and 36 inch greens ( Please add +$1000 if ordering 36 inch greens - Select..
MGP003-24/36 Mini Golf Package #3 Youth course great for practice play. 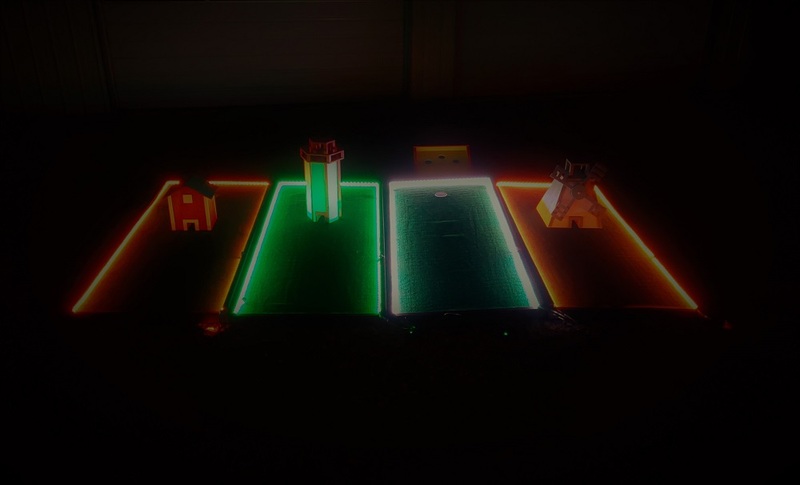 Mini Golf Package Includes Available in 24 and 36 inch greens ( Please add +$1000 if ordering 36 inch greens - Select from dropdown) Nine holes of Miniature Golf ..
MGP004-24/36 Mini Golf Package #4 Par 5 Course Mini Golf Package Includes Available in 24 and 36 inch wide greens ( Please add +$2550 if ordering 36 inch wide greens - Select from dropdown) Nine holes of Miniature Golf with 9 Ob..
MGP005-24/36 Mini Golf Package #5 Advanced Course great for experienced players. 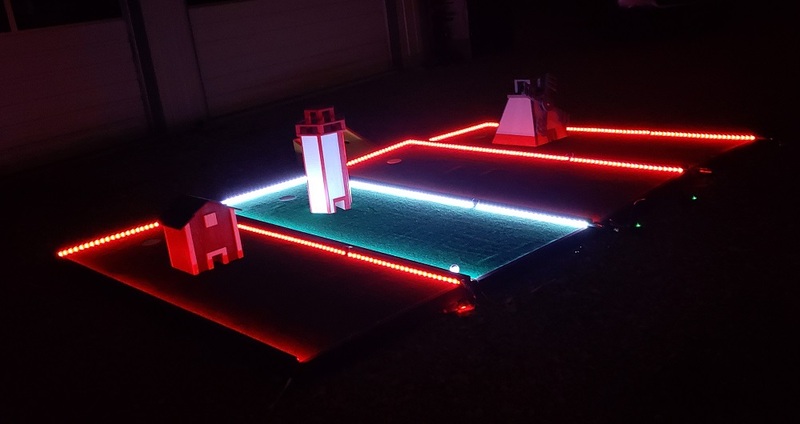 Technical Par 5 course Mini Golf Package Includes Available in 24 and 36 inch wide greens ( Please add +$3000 if ordering 36 inch ..
MGP006-24/36 Mini Golf Package #6 Advanced Course great for experienced players. 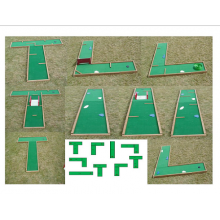 Technical Par 5 course Mini Golf Package Includes Available in 24 and 36 inch wide greens ( Please add +$3600 if ordering 36 inch wide..
MGG-001 Mini Golf Greens Solid wood construction. Greens can be sold seperately without any accessories.Flags sold seperately. Available in 24 inch greens and 36 inch greens(Add $1245.00) Shipping:Additional shipping not included. Plea..